A registered blind ex-soldier from Derbyshire will be remembering friends and family killed in action when he takes part in the Remembrance Sunday march to the Cenotaph with Blind Veterans UK. Brian Eldridge, 67 and from Chesterfield, will be taking part in the annual commemorations in London on Sunday 9th November with Blind Veterans UK, the national charity for vision impaired ex-Service men and women. Brian, (above), who served with the Royal Army Veterinary Corps for nine years, says he will "dedicate the two minutes' silence to people who are close to me who've served and sacrificed." Brian served between 1966 and 1975, stationed in the UK, Germany, Hong Kong, Malaysia, Singapore and the Middle East. Brian says "I joined up looking for excitement and the Army supplied it in spades! "I was working with Service dogs and horses, mainly on security. When we were in Germany, for example, the customs authorities suspected American troops returning from the Vietnam War of bringing drugs back with them - using sniffer dogs we caught the first man within 21 days." Brian has fond memories of his service, saying, "I went in as a green lad at 19 and met my future wife, Margaret, who was working in the Women's Royal Army Corps. "We've now been married for 46 years. Meeting her was definitely the most memorable part of my service." A few years after leaving the Army, Brian was diagnosed with retintitis pigmentosa, a hereditary condition which gradually degrades the sufferer's sight. Since 2006, Brian has received free and comprehensive support from Blind Veterans UK to help him and his family to adjust to life with sight loss. Brian says, "Blind Veterans UK has been tremendous; they have helped me to become independent again, despite my sight loss. The encouragement that they have given me is just brilliant; I can't sing their praises enough. "With their support, I have built up my confidence and my skills, I don't hesitate now to go out alone and I enjoy spending time using my computer thanks to the I.T training the charity has provided." This Sunday 9th November, Brian will be one of over 100 vision impaired veterans supported by Blind Veterans UK who will take part in the national Remembrance Sunday commemorations at the Cenotaph in London. Brian says. "Remembrance Sunday means a lot to me, particularly given that this year marks 100 years since the outbreak of the First World War - my grandfather served in WWI and was gassed and wounded in service. "A lot of my family have served and a good friend who I grew up with died while serving with the Royal Army Veterinary Corps, so I'm going to dedicate the two minutes' silence to friends and relatives who've served and sacrificed." 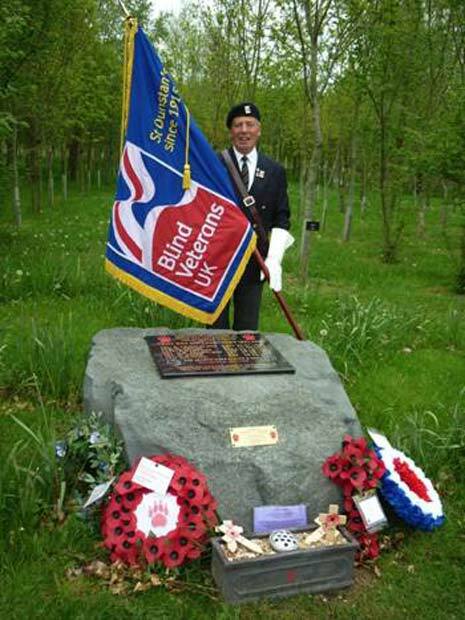 Blind Veterans UK's campaign No One Alone aims to reach out to more people like Brian. More than 68,000 other veterans could be eligible for free help and support without realising it. If you know someone who served in the Armed Forces or National Service who now suffers with sight loss from any reason visit www.noonealone.org.uk or call 0800 389 7979. For more information about Blind Veterans UK's work, please visit www.blindveterans.org.uk.